I've been running a yearly D&D 5e charity event since 2014. Since November 2016 I've been working on the EkstraLiv 2017 charity event. This time I've assembled a team of four to enlarge the event. Together, we've been able to make deals with the Red Cross, focusing on international children projects. We've also made a deal with Fanatic, a shop in Roskilde. The project is far from done, and we're hoping to get approval to bring this project to Comic Con 2017 in Copenhagen. 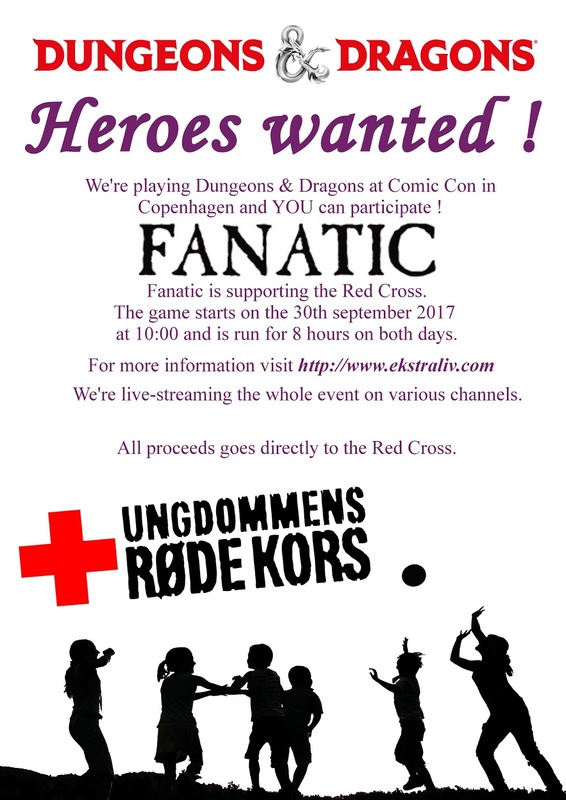 We'd then run eights hours on both days, and anyone with a ticket will be able to join the game for 4 hour segments by donating to the Red Cross. The game will then be run a little bit like Hunger Games, where people can donate to help their favourite players. We're aiming at getting some famous danish people to join us, everything from youtuberes, to Paradise Hotel contestants and maybe even Sidney Lee. We're also aiming at including Giveaways. There's still a lot to do on this project, and our next large workshop will be on the 1st April. Until then, check out the draft of a potential poster for the event above, though it will definitely be modified and improved before it's officially launched.